Francis Vallejo | blog: Dilla! Times are nuts right now. I'm bouncing back and forth between pieces constantly, but I can't complain. I'm really enjoying all my projects! Like this one. 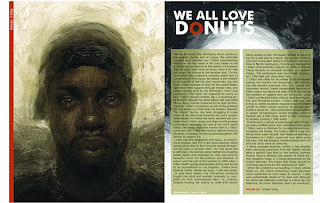 My good buddy Dustin took it upon himself to help completely re-design the great hip-hop magazine the FIND. So he asked me and a close group of illustration friends to help him with some illustrations. I was jazzed when he asked me to do a portrait of the late, great J-Dilla (along with the cover, which I will post soon). 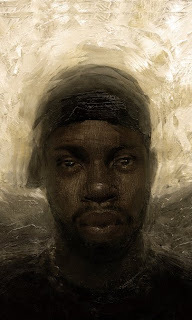 I am a big fan of Dilla's work, and later found out I used to cut grass across from his house, and even went to high school with his brother (now rapper Illa J)..small world!! So I did a fairly straight ahead portrait, but to hopefully add some interest I put some heavy back lighting, inspired by an amazing painting of an angel by Howard Pyle. Since the image relies so heavily on the contrast being just right, I've noticed that it looks dark on certain monitors...sorry for that. I also put up the work in progress layout Dustin and I are working on. I'll make sure to leave a post when the magazine is available!! Really nice work my friend! Great texture. As always, great work. Really like what's going on up in that hat of his. Tight work. Really nice texture. Crazy! I love it. One of the better Dilla pieces I've seen. Whoa man, this is nice! Jay himself would've liked this. love the colors and soft edge around the head. And the pallet knife scraping on the face. Great job man. Oh no you're going to put my last cover to shame, haha. Nice work man. Good to see you doing hip hop related work again. It's where you belong! Came out pretty great man! I can imagine how it is right now, got less the two weeks before grad time!!! I remember slightly going nuts tryna finish everything in time, during those weeks. Fantastic, Francis. the painting is great.